Well, I'm back after over a year long break! I finished updates to 270 Park Ave and 299 Park Ave, and I started on the Lever House. Long term I'm hoping to finish the Citigroup Center, 277 Park Ave, and the Westin Times Square as well as make a few other buildings including 280 Park Ave and the Lipstick Building. I actually built a new computer for rendering and it seems to be working fine except for one bad memory stick, but once the replacement memory comes in a week or two I should be ready to get back to this! Hey everyone! I'm trying to get back into things here. I started a new job a little while ago and school has been hectic, but hopefully I can find a little time to do some updates. To kick things off, there's a night render of 345 Park Ave. Full size here. Click here for the original size. I started another new project. This time it's a pretty recognizable building. Unfortunately the renders are already using over 4GB at a time, so I might not be able to finish this one. I wish I could just get another memory upgrade, but my laptop can only hold 8GB. Hello and welcome to my blog! I'm Paul, a college student currently enrolled at Virginia Tech. 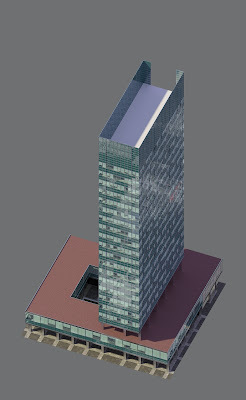 The purpose of this blog is to share my interest in and work with architectural visualization. I started working with Autodesk's 3DS Max after becoming interested in architecture and am currently working with a team to recreate New York City in an old video game (SimCity 4).